Source Independent Transfer measurements allow to determine the frequency response of an acoustical system in a very fast way. Spectrum Analyzers and Spectral History Instruments allow to to analyze your audio signals spectra. The Level History Instrument shows peak and RMS level of the recent past. The integration time for the RMS level is can be set by the user in the range from 10ms to 1 second. The integrated Audio File Recorder is able to record audio files in all common formats — also compressed-formats like AAC can be recorded directly. The Goniometer shows the stereo image of your audio-program and indicates correlation – e.g. you can see phase inversions. This release requires Mac OS X 10.6 Snow Leopard. PowerPC machines are longer supported. LAMA is fully functional with OS X 10.8 Mountain Lion. Fixed: hopefully fixed a code signing issue introduced by the world’s most advanced desktop operating systems build infrastructure that prevented the app from starting. Bug: fixed a bug, where the application would crash when opening a file-player and not lowering the sandbox security settings. Bug: Fixed a bug, where the delay finder window would freeze on Macs with Retina Displays and refactored the delay finder window. Fixed: Fixed a memory leak when closing instrument windows. fixed: fixed a bug where the Compute Delay button in the Transfer Analyzer did not work as expected. Fixed: The average rate and peak fall rate sliders in the Spectrum Analyzer settings view were dysfunctional. fixed: A workspace has not been stored when a keyboard shortcut was not assigned. fixed: Meter showing odd values when Aux Inputs active. fixed: Signal Generator frequency could not be adjusted. Using a new costum theming mechanismn without overrideing private system classes. If available, a instrument-menu can be accessed via right-click on the instrument-settings button in the window titlebar. 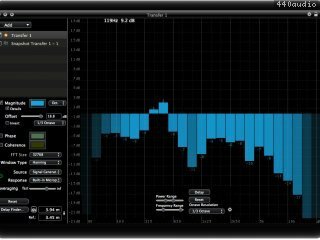 Spectrum Analyzer Snapshots: snapshots of a spectrum can be made via the new Create Snapshots commend in the Spectrum Analyzer instrument-menu. Application could crash when using the FilePlayer AudioUnit. Data Export: Spectrum Analyzer and Transfer Analyzer can export measurement data as CSV file. The existing data export of the SPL Logs Window has been adapted. SPL Log Data can be exported from the SPL Instrument directly (when logging for more than one minute). Data export functions are accessible in the instrument menu. FFT-Size pop-up button in Transfer or Spectrum-Analyzer could become dysfunctional. Bug which could lead to a unreproducible crash in various situations. Accumulation Mode for Spectrum Analyzer and Spectral History instrument: the accumulation of spectrum analyzer can be switched between pink noise is flat, white noise is flat or peak. Ocatve smoothing for Spectrum Analyzer and Spectral History instrument: new method for smoothing curves, creating more readable results for continuous traces. * Input Patch: With the new Input Patch Window it is easy to route instrument inputs to an other physical input. Furthermore it is possible to give a Channel Name Alias to an input channel. * Multiple Delay Finder Results: The Delay Finder can store the last measured results in it's window. * Session loading when Audio Hardware changes: The last session is now bound to an audio hardware device - when using a different device, LAMA can restore it's state into the one being used the last time with this hardware. * Drop Files into Recordings Window: it is possible to drop audio files from the Finder into the Recordings Window - so it can act as a clipboard for often used files for the File Player. * SPL Log Window: A Window holding all SPL Logs. * Big SPL Window: A SPL Meter can open Big Windows – they allow you to have a bigger numeric readout of the Sound Pressure Level. They can also work as a traffic light, as the text color can change with certain level thresholds. * Meter: You can check all channels to be shown or hidden by holding down alt when clicking one of the checkboxes in the table. * Meter orientation can be changed with a "rotate" gesture on trackpad or Magic Mouse. * Some Instruments are moveable by dragging the instrument background – fixes an issue where a vertical meter could become too narrow to be moved by dragging the titlebar. * The Instrument Settings View can be shown by double-clicking into the instrument background. If requested, LAMA's default behavior (showing the settings view by moving the mouse into the lower area of the window) can be disabled with the new show settings view only with double-click item in LAMA's Preferences. * More frequency labels are shown when there is sufficient space and the appropriate setting in the Preferences is checked. * SPL: LEQ Prediction – A prediction (based on the linear average of the last minute) of the expected LEQ value is displayed. * Solid lines for frequency scales are drawn at the same frequencies. (was dependent on the lowest frequency before). * The Info Panel can be closed (and shown again with Window – Info Panel. * Changed Meter Peak and RMS Fall Time (Peak: 1.7sec for 20dB, RMS: 20dB/sec). * Delay Time Offset: delay times are displayed relative to a variable reference point. * Delay Finder: the delay finder window has some enhancements and responds to keyboard commands. Please refer to the user manual for the new functions. 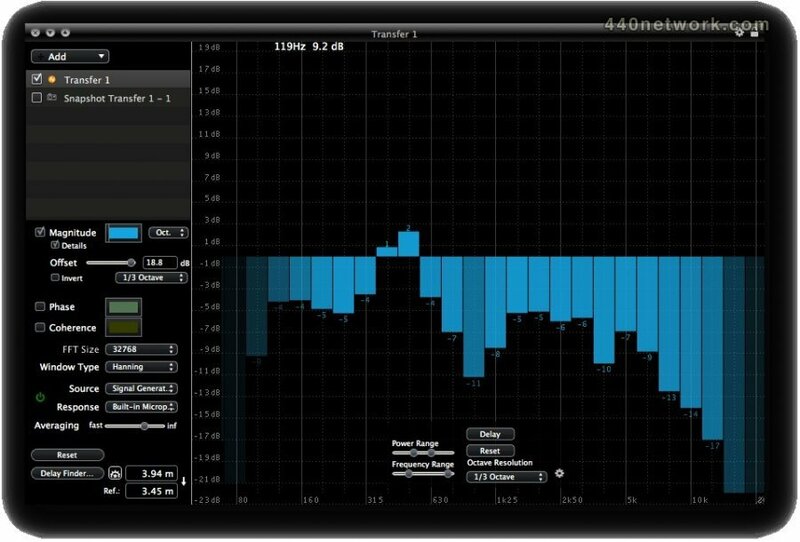 * Spectrum Analyzer: the fall time for the peak curve is customizable. * Peak Bar Drawing Mode: new drawing mode for Transfer and Spectrum Analyzer. * SPL Limit Alert: you can be informed with a Growl Notification when the current SPL exceeds a certain limit. * Clipping Alert: you can be informed with a Growl Notification when one of the input channels is clipping. * Fixed a bug where the name of transfer instruments was not editable. * Faster redraw on SPL Meter when measurement speed is fast. * Fixed a bug where the SPL Meter window could disappear from screen. Timecode & Synchronization Tool. Horae is a show-control software-tool for Mac OS X that can read and generate MTC as well as SMPTE LTC.